PARKROYAL Penang Resort celebrated in style today, unveiling a refreshed resort after an MYR55 million transformation. More than 200 guests witnessed this milestone as the Chief Minister of Penang, YAB Tuan Lim Guan Eng, launched the resort’s new logo identity to mark a new chapter for the resort. Located on Penang Island’s famous Batu Ferringhi beach since 1990, PARKROYAL Penang Resort has undergone several refreshments over the years to stay relevant in Penang’s hospitality landscape. Over the past year, MYR55 million was invested to fully refurbish the resort’s public guest areas, rooms and suites, all-day dining restaurant and lounge. The resort is ready to welcome discerning leisure and business travellers as a premium deluxe resort. Reservations can be made on www.parkroyalhotels.com/penang or by calling 1800 220 021 or +60 4 886 2288. Upon arrival, guests will receive a warm welcome at the resort’s porte cochere and reception, which open out to the palm-fringed sea. 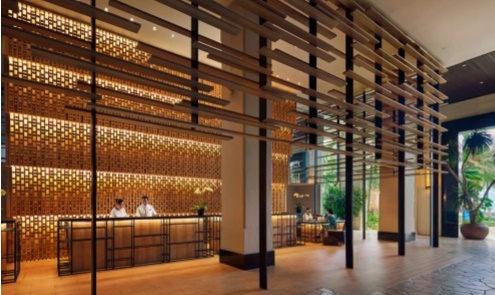 With an elevated ceiling and light-filled spaces with timber furnishings and soothing lights, as well as thoughtful touches such as local artwork which lend a strong sense of connection to the destination, the relaxing ambience at the lobby immediately puts our guests at ease within its tropical surrounds. Each of the resort’s 308 rooms, ranging from 23 to 94 square metres, has been completely renovated. 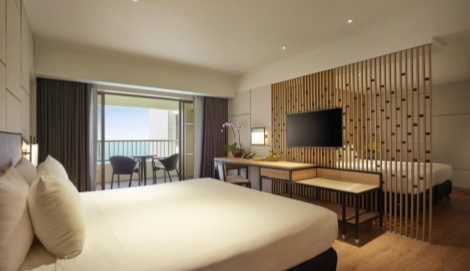 PARKROYAL Penang Resort now offers ten room categories across 284 guestrooms and 24 suites, including the new Two-Bedroom Family Seaview unit, which is specifically designed to accommodate families and groups. At 50 square metres, the Two-Bedroom Family Seaview unit is larger than the One-Bedroom Family Seaview (38 square metres), and offers guests greater flexibility of space to interact and bond with one another. In addition, spacious day beds make the Deluxe Rooms, Family Seaview Rooms, Premier Seaview Suites and Pulau Pinang Suites ideal sanctuaries to lounge by the window or balcony while overlooking the sea or garden grounds. PARKROYAL Penang Resort is also introducing Cinnamon, a 281-seater modern and casual restaurant with an inviting ambience. A new dining concept, Cinnamon emphasises fresh ingredients and the generous use of spices and herbs in its cooking to bring out authentic flavours in local and Asian cuisines. This focus on freshness is reflected in the restaurant’s interior design, which is bright, vibrant and uplifting throughout. Guests can enjoy their meals in air-conditioned comfort (with private rooms available for meetings and groups) or in the outdoors, complete with views of our expansive gardens and beautiful shorelines. The refreshed 80-seater Javana Lounge now features versatile seating which encourages our guests to interact with one another. Oversized, stylish fans create an airy environment, while sofa beds and spacious workstations offer spaces for guests to relax over our delicious cocktails, surf the web, or simply connect with family and friends, all while overlooking the resort’s outdoor gardens and swimming pools, which have been upgraded with enhanced LED lightings as part of our energy conservation efforts.